Those most in need of luxurious pampering and de-stressing should consider booking their spa break at a spa hotel. An overnight stay at such a venue allows guests to get the most out of their treatments and onsite fitness facilities (such as the swimming pool, or gym) and also gives individuals and couples the chance to explore the surrounding city or countryside. Why not make your spa holiday all the more special with visits to local tourist attractions, or a delicious meal at an award-winning restaurant? 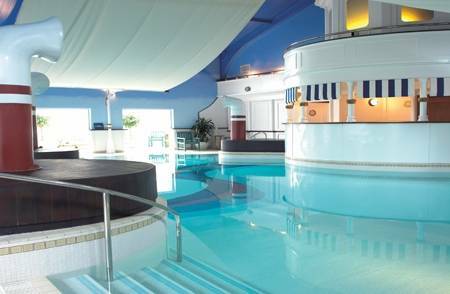 SpaSeekers represents a vast array of spa hotels across the UK, and so you’re sure to find one which perfectly meets your requirements and budget. Need more help booking your spa break? Call the friendly SpaSeekers team today on 024 7671 6192 for no obligation, expert advice. Included in ‘Sunday Times Magazine’s 2011 Top 100 Hotels in the World’ list, this deluxe, five star hotel boasts a gorgeous, vintage Victorian tiled swimming pool, An invigorating relaxation area and a treatment menu inspired by a variety of cultures from around the world. Home to ten beautiful treatment rooms, a 20 metre indoor pool with whirlpool, poolside steam and sauna rooms, an ice fountain and a gym, this 17th century, this grand, Grade II hotel features a menu of rejuvenating treatments using high end products from the likes of La Sultane de Saba, Elemis and Jessica. Mecure and De Vere meanwhile, are two examples of deluxe spa groups with multiple UK hotel locations which are always in high demand. Whether you’re looking for a spa hotel in the heart of a bustling city (London, Birmingham, or Manchester etc.) or hidden away in remote and tranquil countryside (Hampshire, or Norfolk, for example), SpaSeekers has got you covered. We represent more than 500 spa venues located across all regions of the UK, and so whether you’re looking for a spa hotel close to home, or want to ‘make a holiday of it’ by travelling to a never-explored area, you’ve come to the right site. Below you’ll find a list of the locations most popular with our customers, but should your require a venue elsewhere, feel free to browse our site, or contact us for friendly, no obligation advice. We offer a number of deals and discounts for spa venues located across the UK, so you can completely unwind without fretting about your bank balance afterwards. To see our latest promotions, you should visit this page – be sure to check back regularly as many money-off deals from SpaSeekers are available for a limited time online.